I´m sure every Maiden-fan has had thousands of arguments on the subject of the bands best album. But what about Maidens most underrated piece of work? If I am posed with this question, I would without a doubt answer that with Fear Of The Dark, Bruce Dickinsons “final” studio album with Maiden. Even though I was among the hordes of Rivetheads who were jumping through rooftops and hollering with euphoric joy when hearing about the Air Raid Sirens return to the band in –99, this album would by no means have been a poor closer of a chapter in the history of one of the worlds biggest metal bands. After the mediocre No Prayer For The Dying, the band continued on the straight-forward, “back-to-the-roots”-heavy direction of the recent years, but this time with much better results. The opener Be Quick Or Be Dead dishes out superb-quality metal with riffs and solos that would very well be passed as quality thrash-mayhem. Every second-rate Slayer-copycat would be sent running with their B.C.Rich-guitars between their legs into the sewage systems of the Bay Area to practise some more. Bruce uses his majestic voice in a bit harsher way with more ruff distortion and its good, its GOOD. From Here To Eternity is Maidens best slice of mindless hard rock ever. The band seldom did songs this openly “partyish” but it works damn well. One of the best half-ballads ever, Afraid To Shoot Strangers rolls on with insanely catchy choruses and lead harmony melodies while the terribly average Fear Is The Key is left in the middle of Afraid and the awesome, epic drum-armies and intro-lead guitars of Childhoods End. And God almighty, I just love that clanking bass sound that has become a trademark for Steve Harris (along with the machine gun-bass pose on the stage monitor, that is:) The galloping rising of tempo mid-song for the solos takes the neck on a ride. Wasting Love introduces some acoustic Maiden that works just beautifully with a very stylish and emotional ballad. Dickinsons voice is overflowing with feeling and depth that makes one just wish you could pull that same feat off. The heavy grinder The Fugitive starts off nicely but falls out flat before the half-way mark. When something doesn’t catch, it just doesn’t. Luckily the excellent rocker Chains Of Misery picks the pace up with its massive gang-choruses. The Apparition is an OK mid-tempo tune before the ABSOLUTELY most underrated single song of Maidens career hits the speakers, Judas Be My Guide. A guitar lead intro that keeps buzzing in your head for ages, a manic tempo for keeping up a pit and a chorus that is stickier then a mix of super glue and quick dry cement – what more could one ask from a metal song? Weekend Warrior is then again a more mediocre tune that doesn’t impress that much, despite the great solos Murray and Gers pull off. But fortunately for the album, the closer is one of the utter classics and concert-staples of the group, the title track of the album. 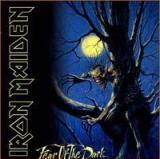 If you are a fan of Iron Maiden, you have heard Fear Of The Dark, probably dig the hell out of it and if not even in concert, then at least at home in front of your stereo, you have screamed out the opening guitar melodies in the “Wo-oooo-o-ooo-OOO-OOOOO-OOOOOO-OOU”-style from note to note in perfect harmony. With only two Maiden gigs under my youthful belt, this part has been executed beautifully by a bit over 11.000 Finns each time. A classic metal song, plain and simple. The sound quality is superb, at least on the re-mastered edition that I have, so I have no complaints on that. Do not be the least bit surprised if you question other Maiden fans about this record and get very different views – you probably will. I just have always dug the hell out of Fear Of The Dark. With only a couple of mediocre tunes to slow down a great set of songs, to me this is the most unrecognised gem in the Maiden treasure chest – hands down.